Looking back those eighteen or so months, I realize I am not the same woman who sobbed those exasperated words to my husband. Granted, I have the same struggles. Wake up to the same challenges every day. But I am not the same. Because of grace. Eighteen months ago, I believed “because I’m not cut out for it” meant I couldn’t homeschool. Today, I’m convinced that I am equipped to rise above the struggles of my flesh and walk in grace towards my children. This lack of virtue has been my life-long struggle. I get irritable. Easily. Gentleness does not come naturally or easily for me. I can’t do all those things all the time. I start… and stop. Learn… and burn (out). I struggle to with stick with basic routines, much less strict regimens. I sometimes yell at my kids, for crying out loud. Seriously, what mama does “have time” to homeschool her children? Who is supposed to clean the house and buy groceries and do laundry and plan menus… while Mama teaches her children? I haven’t even mentioned my role of being a wife, much less the wife of a pastor. Or the many hobbies, side jobs and projects I keep on my plate. I definitely don’t have time. In my house, I mean. [At the time of this writing, in 2012] there are 7 of us living in a 2-bedroom house. Where would I put all those books and supplies and materials- piled on the dining room table? We’d be in each other’s hair all day. It just isn’t reasonable. I need my space! See, I’m definitely not “cut out” to be a homeschool mom. The odds are against me: temperament, schedules, circumstances. It just wouldn’t work! Not because I’m necessarily “good” at it, or because it comes easily for me, or because everything always just falls into place for our family. Homeschooling “works” for our family because we make it work. For us, it is it is a priority. A calling. Even a conviction. Because of our commitment to home education, there are many other things we aren’t involved in, don’t spend our money on, don’t invest our time into. Not because some of these “other things” are bad, but because they would rob us of these precious years to nurture and train our children. I can only homeschool my children once in my lifetime and theirs. Now is that time. It is up to me, and to my husband, to make these days count. For eternity. Ladies, all this is why I choose to get up every morning, sit down at our dining room table, and teach my children in the best way I know how. Honestly, I don’t love it every day. But every day I am learning, growing, and increasingly grateful to be a homeschool mom. Even though I’m not really “cut out” for it. 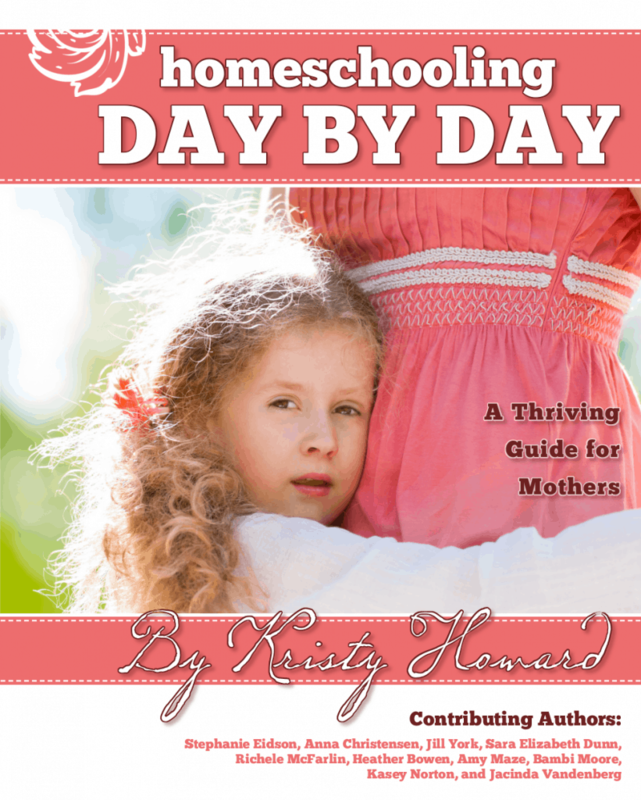 The response to Why I’m Not Cut Out to Be a Homeschool Mom prompted me to collaborate with several other bloggers and write Homeschooling Day by Day: a Thriving Guide for Mothers. I would love for you to check it out and leave a review on Amazon! If something you read here encourages you, please feel free to share with others moms via social media and I’m always delighted when friends subscribe via email! I’d love to connect with you over at our private homeschooling moms group on Facebook, too! After 15 years homeschool our four (three still at home) I am ready to admit….I am not cut out to be a homeschool mom. I am so glad I am not alone. Thank you for this honest, well-spoken truth! I home school and I’m very impatient and wonder what I’m doing everyday. Today, I yelled at my 6 year old because he whines about school and already hates it. I know that yelling at him didn’t help and I just beg God to help me because without him I don’t know what I’m doing. Hilary, you have already taken to first step to victory: recognizing your deep need of the Lord’s help! We ALL need Him, desperately so, and I believe He honors our humility. Find Scriptures to memorize and meditate upon throughout the day, determine to greet tomorrow with a smile, and realize that it takes time to develope new habits. I’m right there with you, Mama, and I KNOW that God is faithful! You can homeschool with joy, despite the struggles. Your article was reprinted in our local homeschool paper (MassHOPE) and it was just what I needed to day. I’m with you in all your struggles and indeed I think am learning more about me and what I need to change than they are learning (not that they aren’t learning…!). At this time I am not, but I respect the vocation greatly. I personally see nothing wrong with public or private schooling. Aren’t we supposed to witness to those around us? What better way then to raise your child in a Christ filled home, and place them in a classroom where they might have the opportunity to share God’s love with those who may never receive it. Speaking for my husband and myself, we do not homeschool on the premise that “public school is bad”, or “private school isn’t good enough”. We choose to homeschool because we believe it is our God-given responsibility and mandate to nurture, educate, and train our own children. As for children being a witness, I see too many children being influenced by secular philosophies in the public school arena. Adults were given the Great Commision, not children. Should children be encouraged to be a witness? Of course! But what better place to nurture and train them for evangelism than beneath the influence of godly parents at home? I was a homeschool mom for a year before coming to the realization that I am not cut out to be a homeschool mom. The hardest part about putting my daughter in the excellent neighborhood public school, where she excelled, was the grief and derision I received from other homeschool moms. But I am so glad I did, both the year of homeschool, and the subsequent 11 years of real school. I developed such an appreciation of those gifted and equipped to teach. Now our younger daughter is excelling in her local public school, with her godly loving teacher, and me to volunteer in her classroom and help her with the rest of her life. Thankfully, God equips and gifts us each individually. And we can offer grace to those whom God has gifted differently than us. AMEN! What a great post- thank you for sharing it. I loved all the points you made- especially not having enough space. We are struggling with this as well at the moment. I’d love to hear how you make the space for everyone- sleeping, homeschooling, playtime, etc. in a future post. Thanks again. Kristy, I can TOTALLY agree with you. Those are my exact reasons for not being cut out to homeschool. Yet, God’s grace is sufficient for every need, and this is definitely a need in which I see His grace coming to my rescue as He desires to see ME teach MY children. Well spoken. After my youngest is finished with highschool, I will have 25 years of homeschool experience. You would think after these years it would become easier, but for me it has not. It is a journey, one that has been beneficial to me as well. Now my oldest is a sophmore in college doing well and reaping the benefits of homeschool. Heaven only knows the good we have set in motion because we choose homeschool. Great words. Keep up the good work! Deut. is my “scripture” for our homeschooling. It reminds me of why I homeschool. some days are not easy but it is rewarding to see your child eyes light up when something really clicks. thank you so much for these posts. I am not yet a homeschool mommy (our first will be born this march.) 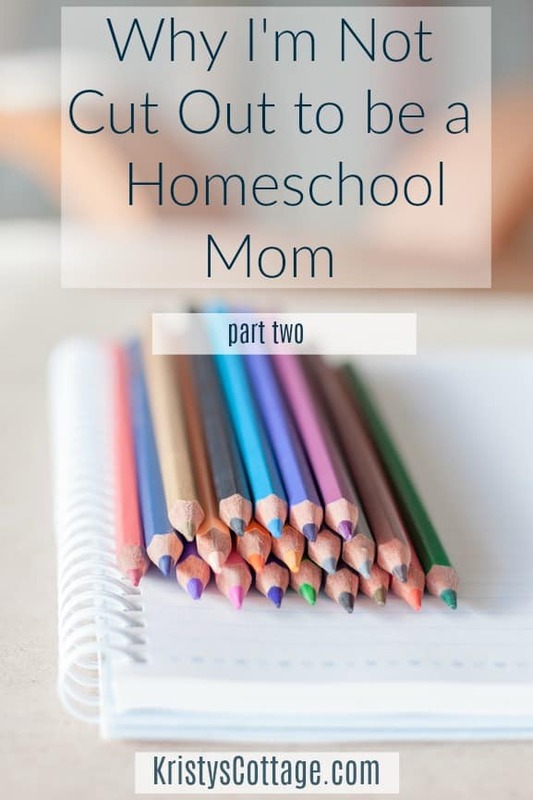 But that is my goal, i want to be a home school mommy and it’s refreshing to read an honest take on homeschooling 🙂 Thank you! When people hear that I homeschool five children, they roll their eyes and emphatically let me know that they could never do it. they think that I am made of something different than they are, when in truth, I have the same struggles. My kids bring out the worst in me for the best! I constantly strive to better myself. It’s lke we have a built-in acountability system: it’s called our kids! They know when we are doing what we should be and if we are conscious of trying to be their example, we will always try to do better. This motto keeps me going: Tommorrow is a new day filled with new and exciting opportunities to try again! Just never give up! I for sure struggle with inconsistency and chaos and impatience! Thank you for these GREAT posts, Kristy! I’m not cut out to be a homeschool mom! I’m tired, I have a chronic disease that requires transplant, I’m impatient, I have a toddler. I could go on and on. Those are some ways that THIS homeschool mom is not cut out for it, except we do it and we are excelling (most of the time). We love homeschooling (on good days). I just recently found your blog. Based on your description of yourself being impatient, I think we are long lost sisters! It, unfortunately, describes me to a t. It’s nice to know I’m not alone in these struggles. So many homeschooling moms that I know don’t seem to have these issues that I often feel I shouldn’t be homeschooling. Thank you for the encouragement in this area today!